WSA has a Cadcam FB7100 laser cutting machine which can cut a range of materials and fabrics! Laser cutting costs £2.00 per lasercut for students - however, if your artwork will take over an hour (£4.00) to cut you will be asked to make an appointment with the laser operator to assist in the production of your work - please keep an eye on your Snowhite messages. The cut area of the machine is : 707mm x 964mm. The laser cutting process releases different fumes and particles depending on the material cut. Ensuring we only cut appropriate materials is important for the safety of the operators and prevents damage to the machine. For example we cannot cut PVC as when it is heated it releases chlorine gas resulting in hydrochloric acid which is toxic to humans and corrosive to machines. You should be able to show a delivery note indicating the product was purchased from a company selling laser friendly products or from our approved suppliers list. Please check the permitted fabrics list. It is safe to laser natural fabrics such as Leather, Cotton, Silk. You should be able to evidence what your fabric is. This can be done with a phone photo of a label attached to the roll from the store, a receipt and link to the online purchase. The information needs to detail the composition of the fabric. If you want to purchase from your own supplier, or want to use an unusual material then you must provide a CSC technician with a Material Safety Data Sheet (MSDS) for the material for approval before it will be processed. These materials are fine for use with our laser cutter. However you must ensure that the material does not contain any substances from the prohibited list. For example woods that have been glued, such as Plywood, are not always laser cutter safe; depending where the material has been purchased from. It is worthwhile having a test done before purchasing a large amount of material to make sure you are happy with the results. 1These materials should be supplied from our list of approved suppliers. Plywood, MDF and Acrylic that is supplied from DIY stores is often inappropriate for laser cutting. These materials, or anything containing these substances, will not be processed in our machine under any circumstances. You must ensure the materials you provide are laser cutter safe. Make sure your document size is the same dimensions as your material - measure! Delete objects from the pasteboard - the laser will try and cut them! Don't use white filled boxes to hide objects / create shapes - the laser software sees all objects even hidden ones. In Illustrator choose File > New. Make your New Document Profile = Basic RGB and alter the width and height options for the size of your material. The parameters of your design for laser cutting must be or within 707mm x 964mm. The easiest way to visualize how your artwork translates to the finished cut is to imagine laying the pieces you want to make on a sheet of paper, then drawing around the edges before taking them away. Your design should look like the lines left on the paper. 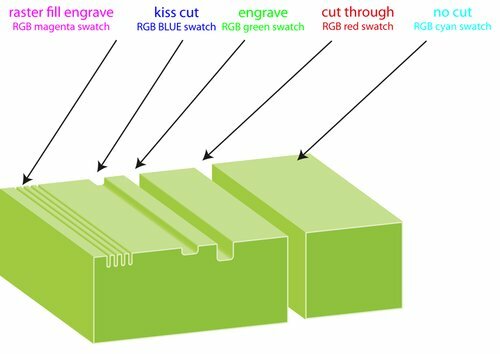 The color of the line you draw determines what the laser cutter/engraver will do - see diagram. All thickness of all three options are thin – approximately the width of the laser’s beam. Vector line engraving works in a similar way to cutting, but instead of cutting right through the material, the laser just marks the surface. The laser will trace along the engraving line you draw. There are two different strengths available: kiss cut and engrave – with corresponding depth and darkness. Draw a line or shape. Then set the stroke weight to 1pt. Set the stroke colour to a RED swatch in the swatch panel. All lines must be the same swatch colour. Set the stroke colour to a BLUE swatch in the swatch panel. All lines must be the same swatch colour. Set the stroke colour to a GREEN swatch in the swatch panel. All lines must be the same swatch colour. Raster fill engraving is used for filled areas, the strength of the raster engraving ranges from black as the heaviest, down to very pale gray which is the lightest (or white, which is none). Vector shapes or a Photoshop image set to Greyscale can be used for raster engrave. To prepare your Photoshop image (Image > Mode > Greyscale) and save as a PDF. To create vector artwork of an image, you’ll need to trace the image you want to incorporate into your design. You can do this by selecting the inserted image and using the Object > Live Trace > Tracing Options command. You’ll see there are several tracing options so try out a few until you find the one you want. Next, you’ll need to use the Object > Expand command. If the trace has worked correctly, vectors should appear around all of the individual parts of the traced image. There will also be a clear rectangular box around the outside of the traced image – select this with the ‘Direct select’ tool and remove it. Sometimes if you are using the ‘Live Trace’ option it’s possible you’ll end up with cutting lines sitting one on top of the other - they may appear darker or slightly thicker. You need to change these double lines into a single cutting line. Otherwise the line will literally be cut twice – which is not the best for your material, or the machine. To remove double lines, select them using the ‘Direct select’ tool, then hit delete once or twice. This should leave behind another line. By removing double lines you’ll achieve a better result. Sometimes lines too close together on some materials may cause the shape to be very fragile or to burn away completely so this is worth considering. Another technique that is quite quick, though only works on certain files is to use Illustrator's 'Pathfinder' panel, which can be found through selecting it in the 'Window' menu.